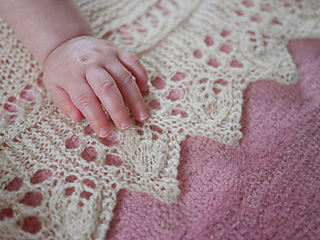 A lightweight, traditional knitted square in three sizes (S/M/L) serves a multitude of purposes from christening blanket to wedding shawl to lap robe and the simplicity of this design makes it all the more flexible. 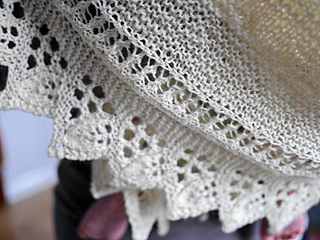 Worked in the round from center to hem, the body is composed entirely of garter stitch, then finished off by a deep openwork border of overlapping leaf motifs. Its ornate appearance belies the simplicity of its construction; this piece knits up quickly and effortlessly to create an heirloom that could celebrate a lifetime of important milestones.